Re: Any synsepalum dulcificum expert?? Wow, you are doing a great job and you have done your research well. Miracle berry is notoriously poor to germinate about 24% and very slow to grow. Miracle berries like acidic soil like blueberries in the pH 4.5-5.8 range. Peat moss and perlite works for that. Peat moss has a pH of around 5.5. They are very slow to grow. We have one miracle berry that we have been trying to propagate. It is in a pot under 47% shade cloth. So it is not dark, it gets good light. It has been in the same pot for years and has hardly grown maybe an inch a year. It is not uncommon for long lived plants to be that way. The nursery gets watered daily, but it is in a shade house so humidity is high and air circulation is good. It is not being grown indoors. We do not get frost here and the temperature never reaches freezing so it stays in the shade house all year. The plant should be watered when the soil is almost dry, but should not be soggy or dry out. We tried to layer the plant and tried with seeds. So far, the best luck we have had germinating seeds has been to plant them with a companion. Your leaves look a little yellow and soft. It may need a little more light and make sure it is not over watered. We supplement with Miracle grow for acid loving plants a.k.a. Miracid. It contains micros and is an acidic fertilizer. ok, i think my miracle fruit has root rot, leaves turning yellow and are drying out :/ what can i do now? should i trim infected roots and repot to new soil?? If you have root rot you have no choice but to try to cut out the dead roots and repot. Dip the roots in a fungicide that works in the soil. You will need to read the labels for ones that work on phythoptora. The only one I know of is subdue but it is very expensive and you need to get a license for it. There may be others around. I do not like decorative pots. They do not breathe. It is hard indoors to control soil moisture. I don't think you need a heat mat. If you are comfortable in your home and you have the thermostat at least 65 degrees your plant would have enough heat. The lights close up also generate heat. ok, thx for info, i'll try to do this tommorow. LED lights don't generate heat so i'll try them. My synsepalum arrived about a month ago. First i keept it under foil, but recently i have put it into the terrarium. I have stable temperature 24-27 C and humidity 75%-90% PH 5,5-6, not full sun. Soil is a mixture 1:1 acid peat and perlite. I use airpot. The problem is that some leaves are getting yellow. Not full yellow but, they have green spots and rest is yellow. I haven't found on specialists website anything simillar. I aslo use heating pad, - like for terrariums. I thought that maybe this is a reason, but leaves that are away from it also stated to change its colour. The top leaves seems to be fine. Looks like fungal or maybe mites. The terrarium may have too much humidity. We grow miracle berries in a shade house under 50% shade. Temperature ranges from 70-90 year round. Shade house humidity is around 80%-90%. It is also why no one really likes to work in shade houses in the middle of the day. The bench it is on is watered daily, but the shade house gets good air circulation and is located in a relatively dry part of the island. Thank you for this suggestion, maybe air circulation is a problem here, but humidity is for sure good, as i see current measurement on display. 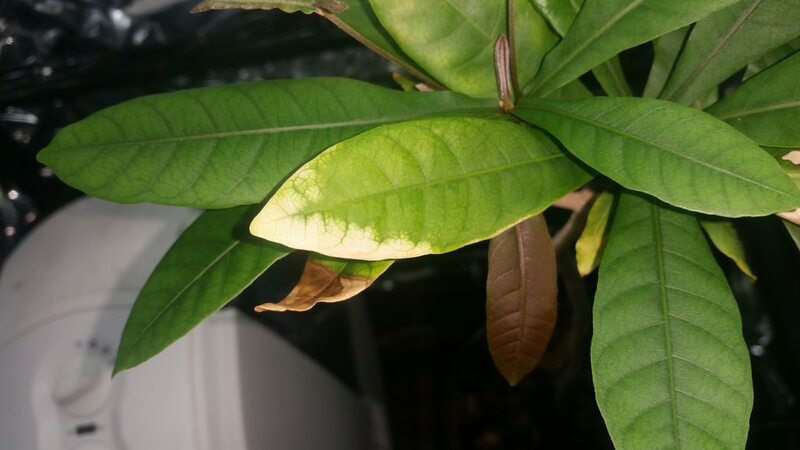 I am having issue where some leaves discolor to white but strangely stay alive and in good shape, i use fertiliser once a month for acidic soil, its in perlite pear moss mix and hasent been repoted recently, its a green house at 70% humidity and 25c, only gets watered when soil start to be dry, other leaves are growing but some old leaves discolor, also my new leaves grow purple than turn green after, is it normal?